If you follow me on Instagram @misclaseslocas, you may have seen Quizlet Live relay races on my Insta stories. I have had quite a few people message me with questions, so I figured a blog post was in order. As a side note, if you want to see more day to day classroom happenings @misclaseslocas is where you will find it. First of all, I have to give credit to this idea to Ashley aka Srta. Spanish who blogged about variations of Quizlet live. She got the idea from the Quizlet blog, but without her sharing it, I would not have tried it! Like any new and fun interactive game, almost every teacher in my school is using it now. This means students are over it and it is time for a change. Enter variations of Quizlet live, which lead to the relay race. Also, you know I LOVE to incorporate movement, so this was a win win. Pick the Quizlet set you are gong to use and the teacher clicks "Live"
Once groups are created, set specific areas for each group to meet. The group lines up a few feet away from their devices. (Or if you have limited space all other students turn around or go on the other side of the table if possible). 1 student comes up to answer the question for the entire group using all 3-4 devices to find the correct answer. (To ease anxiety I allow students to pass if needed). Once they answer the question, they go to the end of the line and wait their turn. This repeats until one team has answered all questions correctly and wins. You can then play again with the same teams if they seem even, shuffle teams and play again with a new group, or go back to class as usual. 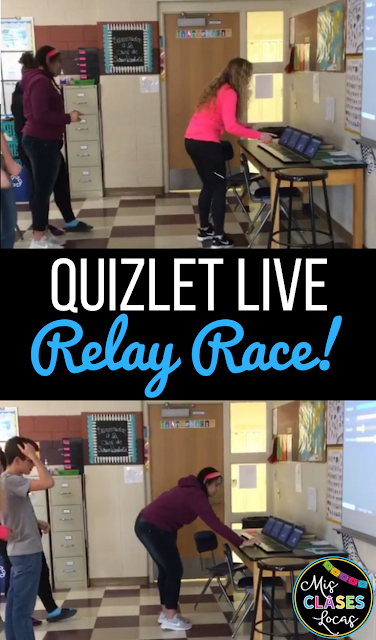 How can I use Quizlet Live Relay? I personally only ever use Quizlet Live for about 10-20 minutes. I want to keep it fresh and leave them wanting more. You can also teach students how to cheer for team in the target language. It works great to introduce vocabulary before starting a chapter. This would be a good way to start class to wake up those morning classes and get the blood pumping, while getting practice with new vocabulary. Just search the novel chapter or vocabulary you are covering and I bet someone has already created one. Do you ever finish a little early? Use those 10-15 extra minutes to review what you have been learning and move around getting out the end of the class wiggles. You can have comprehension questions, who said it quotes or other Spanish-Spanish matching to avoid just straight translation of discrete vocabulary. Kara Jabobs has a great post, Get more CI out of Quizlet Live which includes showing how to use fill in the blank, question and answer or other variations to mix it up. 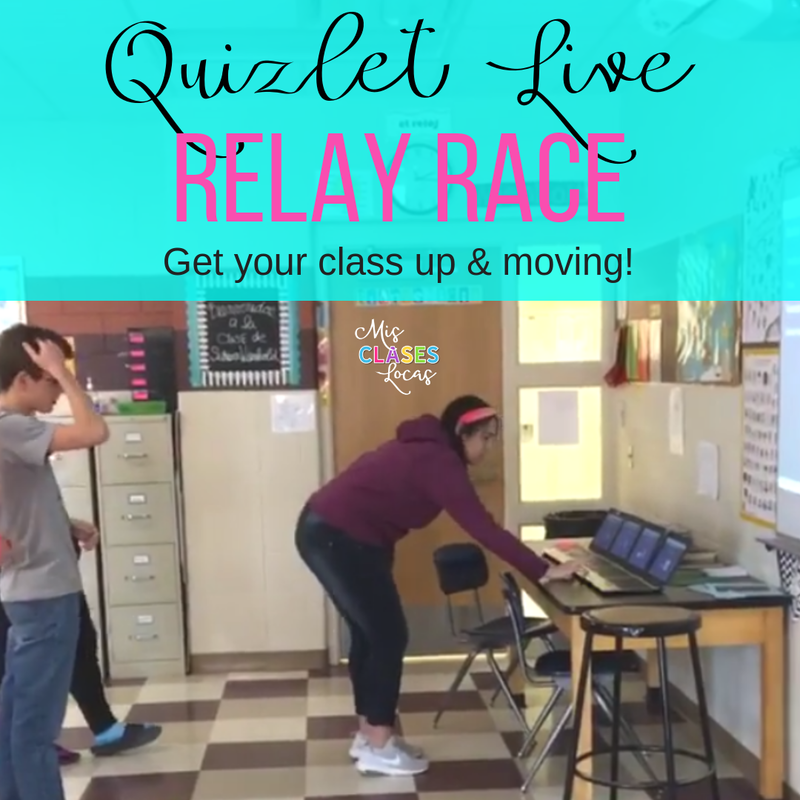 Use one or two rounds of Quizlet Live Relay to break up your class. Set a timer to see if everyone can get logged in in under a minute or a certain time as a race, since we know logging in can be an annoyingly long transition :) Get everyone moving and then move on to the next portion of class with renewed energy. What are other Quizlet Live variations you have tried? Please share! If you love Quizlet, make sure to also check out GimKit too! For more games for Spanish class, follow my Pinterest board!